As a bicycle and pedestrian advocate who moved from Denver to Fresno, I was at first a little aghast to hear that Fresno was considering removing its pedestrian mall. It seemed to go against my logic and all that I had worked for. Yet, once I listened to the practitioners and experienced the Mall for myself, I began to understand the challenges at hand. After listening to the insight from other downtown directors, analyzing the data and observing national trends, I too, posit that a vibrant main street will be an integral piece in Downtown Fresno’s revitalization puzzle. Pedestrian malls in the United States have an 89% rate of failure. Most have been removed or repurposed. Only 11% have been successful. Of the 11% successful pedestrian malls, 80% are in areas with populations under 100,000. 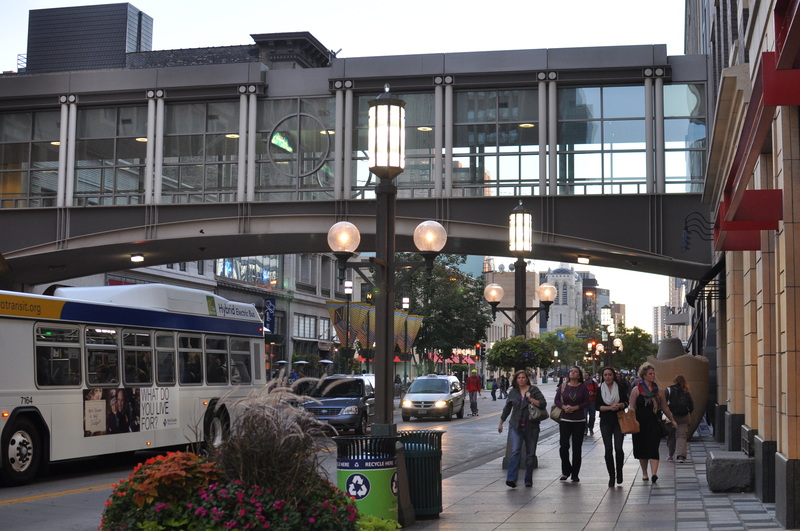 Cities that have transformed their abandoned pedestrian malls into “Complete,” “Main” Streets have experienced turnarounds in their downtowns with more investment, higher occupancy rates and more pedestrian traffic. 90% of these cities see significant improvements in occupancy rates, retail sales, property values and private sector investment in the downtown area when streets are restored. What does this mean for Fresno? Fresno’s Fulton Mall is a six-block pedestrian mall on the site of Fresno’s one-time “Main Street,” and the most densely built part of the entire Central Valley. Right now, the Fulton Mall is currently operating at 6% of its economic potential, with 70% of the historic buildings sitting vacant. It is not a success. Restoring it to the historic main street meets the model of success that has worked in hundreds of other cities around the country, catalyzing immediate investment on that corridor and surrounding streets. Opening up the Fulton Mall will allow for accessibility, economic competitiveness, a chance to save historic buildings, and the opportunity to create a vibrant urban center. While transforming the pedestrian ma ll into a complete main street isn’t the entire answer, it is a key piece of everything else that is happening including cooperation between public and private partners, High Speed Rail, Bus Rapid Transit, partnership with federal agencies via Strong Cities Strong Communities, Lowell Neighborhood revitalization, new downtown parking management and Downtown’s first Business Improvement District. Plus, it’s paid for. The City of Fresno received a $16 million TIGER grant to restore the Fulton Main Street. This money is a federal grant that can ONLY be used for this project, restoring Fulton to a street. The design options incorporate the art and character of Fulton, wide pedestrian-friendly sidewalks, streetscaping elements, multi-modal access (bikes, pedestrians, cars) and on-street parking.